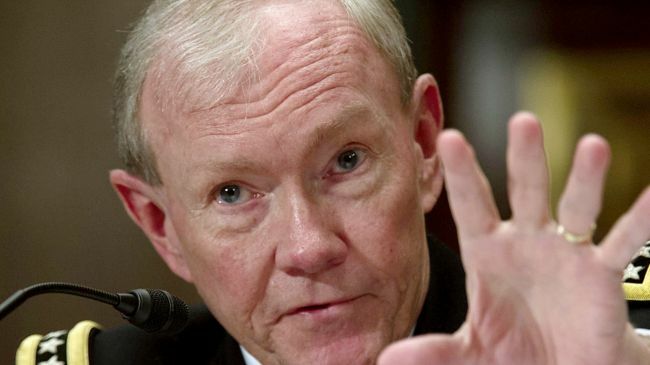 The U.S. has more and better options to deal with Iran’s nuclear program than it did just a year ago, U.S. Chairman of the Joint Chiefs of Staff General Martin E. Dempsey told the New York Times in an interview Thursday. “Since my last visit to Israel a year ago, we have better military options on Iran,” Dempsey said. As Iran has continued its nuclear development program, the U.S. has expanded its options for dealing with the threat, Dempsey claimed. American forces are training to deal with threats like those from Iran, “and we continue to develop technologies” that could be used to halt Iran’s efforts, he said. Netanyahu told Dempsey that Israel faces many threats but the one threat that “dwarfs” all the others is the Iranian nuclear threat. In the interview, Dempsey said that Israel “of course would like the United States to continue to present a credible military threat to Tehran,” but that both countries had agreed to give diplomatic measures and economic sanctions a chance to work.